Popular culture has cheerfully tapped into this desire. Singin’ in the Rain (1952) perhaps said it best in the song, “Make ‘Em Laugh/Don’t you know ev’ryone wants to laugh?” (Words & lyrics by Nacio Herb Brown and Arthur Freed) While “high arts” like painting and sculpture have rarely considered humor a worthy subject, popular culture has never felt such restraint and has always reached out to far wider audiences than one-off paintings or sculpture. 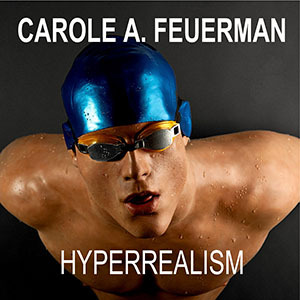 The desire for ever-wider audiences has constantly sparked new platforms of technology. 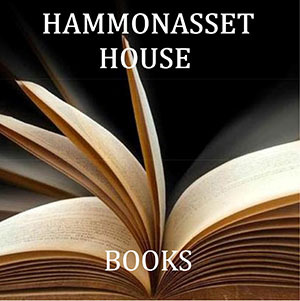 This was as true in the fifteenth century when technology allowed print-making to be a mass-produced art, as it has been in modern times, when technology consistently facilitated the collaboration between humor and the rise of a mass audience. America’s commercial radio in the late 1920s and ‘30s owed much of its success to the popularity of such comedy shows as “The Goldbergs,” “Fibber McGee and Molly,” and “Burns and Allen.” In the late 1940s, television owed its initial success to slapstick comedy: who could resist guffawing when Milton Berle got a pie in the face, or giggling when Jack Benny tried to play the violin? Today, viral videos of cats being silly fuel the giant social media engine. 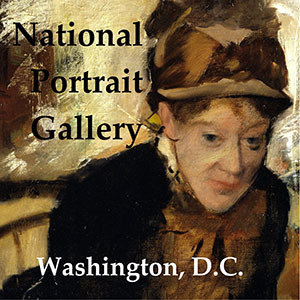 Drawn from the National Gallery’s collections, Sense of Humor is organized chronologically in three galleries, starting with early caricatures of the Renaissance, moving to eighteenth and nineteenth century English and French satire, and finishing with provocative comics associated with the American counterculture in the 1960s. In the first gallery, the exhibition shows that the fifteenth century “saw the emergence of many kinds of humorous images,” with caricature serving as “the inevitable counterpart to the Renaissance study of natural appearance.” Broad exaggeration and parody were featured, with themes often trumpeting the violent contrast between high ideals—political, religious, and ethical—and the reality of everyday life. 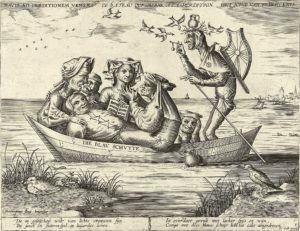 The “Ship of Fools” and archetypal antiheroes were often recurring motifs: in Pieter van der Heyden’s 1559 engraving, The Ship of Fools (above, right) is shown as a parody of the Christian church and depicts it as a decrepit vessel with a feeble pilot and dissolute passengers of prostitutes and their customers. In the second gallery, satirical images of the eighteenth and nineteenth centuries focus increasingly on specific people and current events. Major artists begin to dedicate entire careers to comic art and caricature, with William Hogarth sparking a whole generation of British artists who created some of the most biting satire every made. 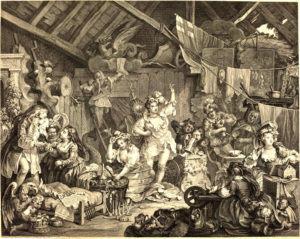 Hogarth’s Strolling Actresses Dressing in a Barn, was a stinging riposte to the British government’s 1737 Licensing Act, which sought to censor free speech in British theater. The development of lithography in the nineteenth century allowed graphic arts to be reproduced quickly and inexpensively, allowing almost immediate commentary on current events. Censorship emerged at the same time to quash the era’s “fake news,” but artists like Honore Daumier became adept at nuanced critiques rather than direct attacks. 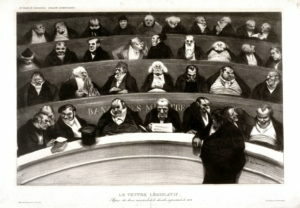 One of Daumier’s delightful skewerings showcased in the exhibition, is his 1834 lithograph Le ventre legislative (The Legislative Belly), right, which depicts the conservative members of France’s Chamber of Deputies dozing and goofing off while their overfed bellies spill over their otherwise empty desks. 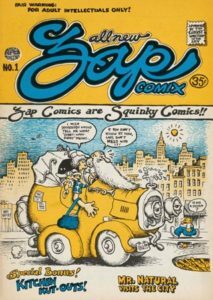 The final exhibition gallery features twentieth century humor, and ranges from works by George Bellows, Alexander Calder, R. Crumb, Art Spiegelman, to the Guerrilla Girls. 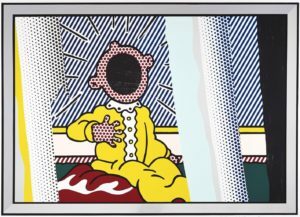 There is a 1972 Andy Warhol poster of Richard Nixon beckoning voters to Vote McGovern, and an eye-popping Roy Lichtenstein satire on Edvard Munch’s The Scream (left) that features Popeye baby Swee’Pea screaming for attention. 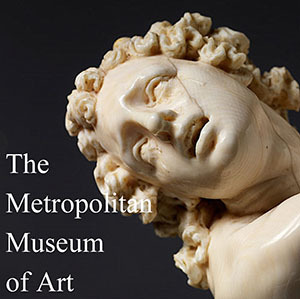 Sense of Humor is the kind of exhibition that simply functions as a display of museum collections. 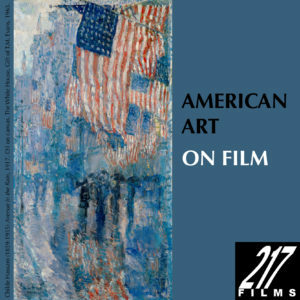 Organized chronologically, it lacks any imaginative narrative thread, almost as if the National Gallery curators worried about wandering too far from art’s serious identity. Nor is there any catalog or brochure, to give more meaning or context to this display. An essential question that has been totally overlooked here is whether humor can exist without an audience. Sense of Humor fails to consider how the role of ‘audience’ impinges on the very purpose of humor itself—to make us laugh. SENSE OF HUMOR at the National Gallery of Art, through January 6, 2019. 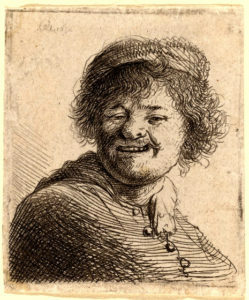 Right: Rembrandt van Rijn, Self-Portrait in a Cap: Laughing, 1630, etching, Rosenwald Collection, 1943.